The first thing you are probably thinking is why on earth are BloodGuts pushing a decade plus Disney franchise adhored by kids across the world that near enough most horror brands have ignored for all of this time. Let’s rephrase this… why aren’t horror brands recognising a tale that covers ghosts, zombies, voodoo, witchcraft and all other more of the sea? 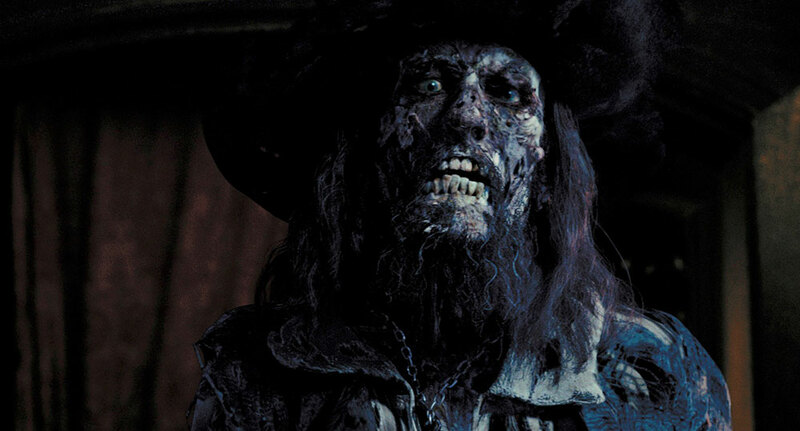 PIRATES OF THE CARIBBEAN needs no introduction it does need some further attention and love from the horror community. 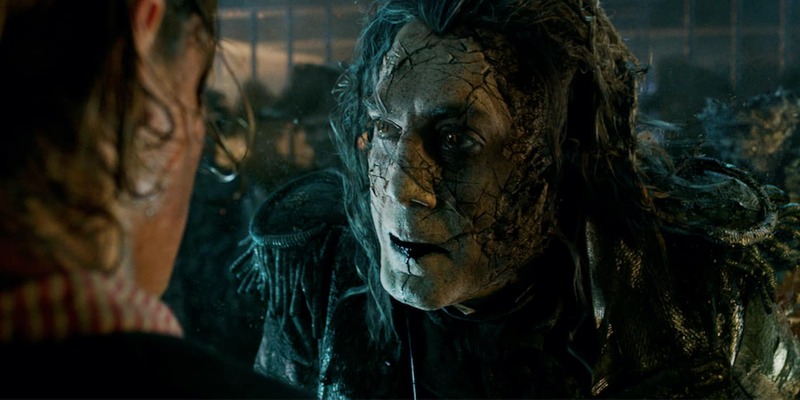 As the fifth entry, SALAZAR’S REVENGE, hits cinemas this month, tbe return of Jack Sparrow brings about even more supernatural tales and fills a void in the horror genre that has never been filled. In 1980 John Carpenter gave us THE FOG and it’s fireside story of ghosts and revenge were favourably tailored towards children rather than Carpenter’s wider audience. Omitting blood and the violence famed for the director, his attempt to make kids horror film failed when the ratings boards still found the film too scary and quite rightly too. Enter 2003 and Disney announce one of two ride based movies (the other being another horror based movie but this time with more comedy, the Eddie Murphie vehicle, THE HAUNTED HOUSE). Starring hearthrob Orlando Bloom, Kiera Knightly, Geoffry Rush and a career revival for a little known Johnny Depp, this movie was to take a darker side to live action than Disney had ever proposed before. Pushing the boundaries of the 12A rating, THE CURSE OF THE BLACK PEARL would be the first of five films (so far) to embrace life on the seas and a testing example that kids still lived pirates. Heck, PIRATES at the time was thought to become a flop by many as there was little appetite for a swords and ships movie wmof which such a genre didn’t fair too well at the box office. In 2003, the top 5 grossing Pirate movies were HOOK, RETURN TO NEVERLAND, TREASURE PLANET, MUPPET TREASURE ISLAND and THE ISLAND. Two being PETER PAN adaptations, two being TREASURE ISLAND adaptations and one being an eighties horror movie starring none other than Michael Caine. A lack of original source material may have much to do with the lack of pirate movies but why has the sub genre of cut throat vigilantes and super natural folklore been abandoned for so long and why so by a genre that has tired out almost every other fantasy? That may be mostly down to one film in particular, CUTTHROAT ISLAND. Released in 1995, the film bombed worse than a ship full of gold hitting an iceberg. Starring some of the 90s biggest icons, Geena Davis, Matthew Modine and Frank Langella, CUTTHROAT ISLAND had a huge budget of then $98m. This was the PIRATES… before it’s time or so it was thought. A straight laced swash buckler, CUTTHROAT played it too safe and suffered because if it this putting a black cross against pirated for almost a decade. But why ignored by the horror genre? Truth be told, pirates are a nightmare for budgetary constraints and while THE FOG bought the strong to a modern scenario, to create a true pirate horror film would need ships, ocean, costume and good folklore. All stuff that needs a considerable budget, something Hollywood mainstream couldn’t commit to pirates so how could the horror genre. That all changed with PIRATES OF THE CARIBBEAN introducing cinema goers not only to pirates once more but also ghosts and terror. It’s easy to ignore the series as a mainstream fantasy and while THE franchise has stretched it’s comedy and wild world, it’s feet are still firmly planted as a horror film first, something rectified by SALAZAR’S REVENGE. I remember seeing THE CURSE OF THE BLACK PEARL three times upon release, why some my ask? Well, apart from being a revolutionary film, it was at its core a terrifying horror film that John Carpenter would have been proud of. The story of a band of pirates cursed to sea at night murdering those who come in their path. No blood, minimal humour and some horrifying sights, what is not to love for kids and grown ups alike. Akin to many of the 90s pirate films, Gore Verbinski could have lightened up proceedings but instead created a world that even had adults cowering behind cushions. PIRATES has since grown and now has the top 5 grossing Pirate films ever all to itself. A franchise that has seen ghosts, killer mermaids, gods and frankly disgusting sea monsters all take centre stage and deliver on not only gracing mainstream cinema but scaring audiences from 8 to 88. 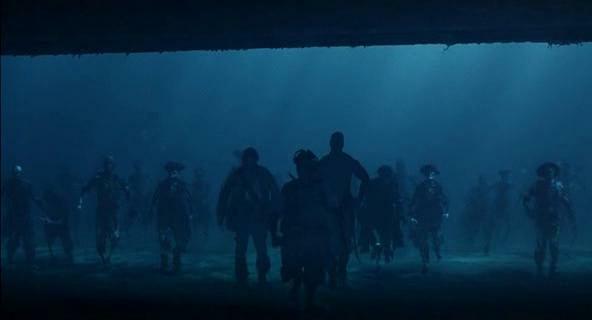 One scene in particular for the series that resonates well as a horror fan is that of the unread walking on the base of the sea, something reminiscent of the DAWN OF THE DEAD. It’s one of many references layered through the series and should hold it’s head high above the ocean as the best hoses based horror franchise in cinema history. Even the opening of AT WORLD’S END shows a no holds barred hanging of many pirates that is uncomfortable and unsettling to watch.